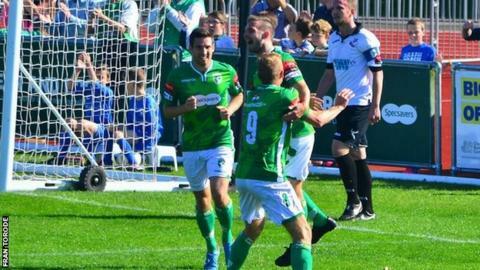 Guernsey FC registered their biggest win of the season and kept their first clean sheet of the campaign as they beat Ramsgate 3-0. Matt Loaring, who was making his 150th appearance for the Green Lions, struck twice while Ross Allen got the other. The result keeps Guernsey fifth from bottom of Isthmian League Division One South, but they have at least two games in hand on the teams around them. "It's good to get back to winning ways," Loaring told BBC Radio Guernsey.